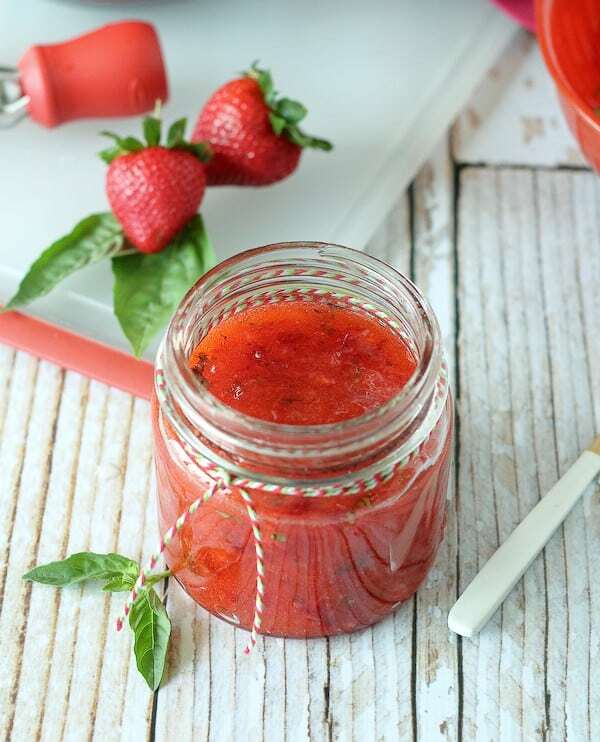 You’ll love the basil in this strawberry basil freezer jam — it is the perfect complement to your favorite slice of toast. Strawberry freezer jam — one of the best parts about visiting my parents. My mom always has some stocked in the freezer for us to eat while we’re there. I sometimes even manage to return home with a jar. Honestly, I could eat it by the jarful spoonful, but I try to hold myself back since there is…umm…quite a bit of sugar in it. But it’s jam, so that’s to be expected. 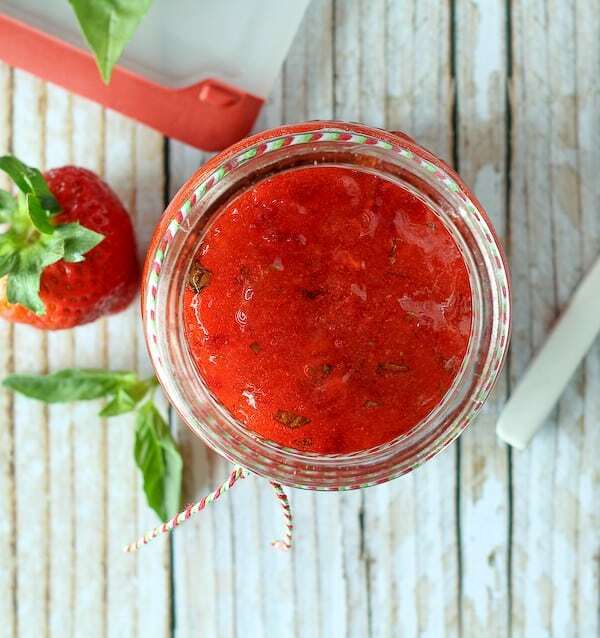 This strawberry basil freezer jam is a twist on my mom’s classic strawberry freezer jam. The addition of basil makes it undeniably perfect for summer. 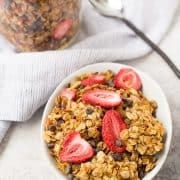 I love it obvious things such as toast, bagels, corn bread, but it is also amazing stirred into some plain Greek yogurt, spooned over some vanilla ice cream, or even stirred into some hot oatmeal. Clearly, I find any possible opportunity to use the stuff. And it’s unbelievably easy to make. 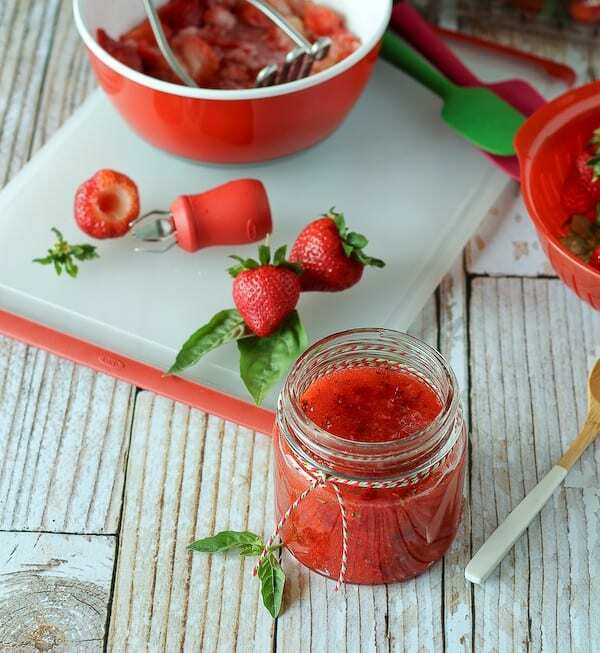 One of my favorite brands, OXO, sent me some Driscoll’s strawberries to create a recipe with — and I knew immediately that they would be destined for strawberry basil freezer jam. Hulling the berries is easy (and dare I say fun?) 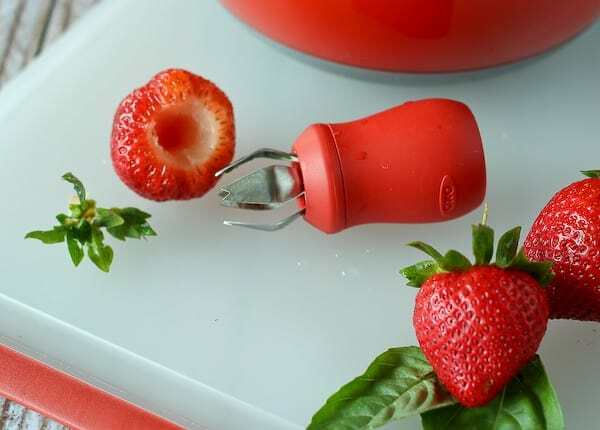 with the OXO Strawberry Huller. All you do to make this is mash up the berries (I used an OXO potato masher, of course). You’ll want lots of good chunks in there still so don’t worry about getting it completely pureed. Then you stir in 4 cups of sugar. Yeah….4 cups. This is why it’s called jam. And not healthy jam. Or fresh fruit purees. It’s the sugar, baby. Totally necessary. Then you stir in some fruit pectin, pour into jars, and freeze. 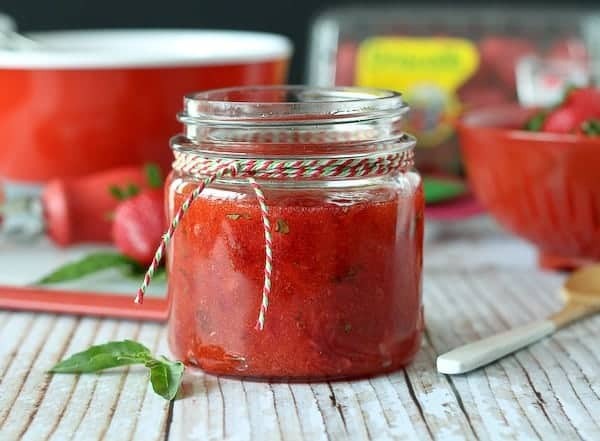 Or keep the strawberry basil freezer jam in the fridge. Easy peasy! Watch the video to see the step-by-step process! 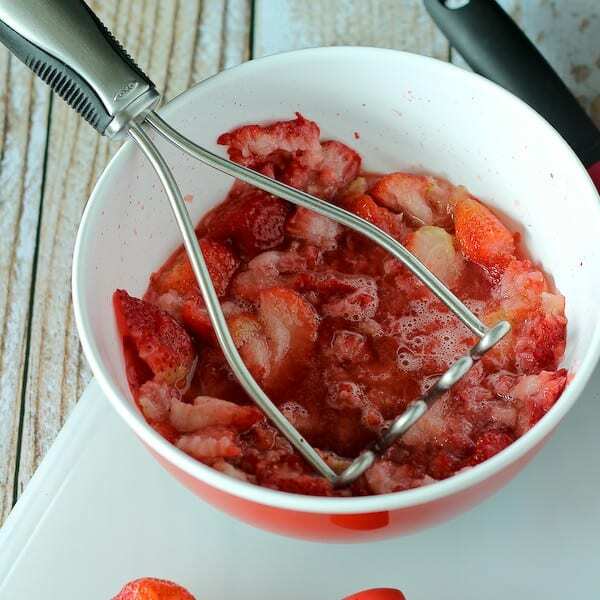 In a large bowl, mash strawberries using a potato masher. Measure out two cups and return to bowl. If there are extras, you can eat those. But you want to pretty exact with this recipe. To the 2 cups of mashed strawberries, stir in 4 cups of granulated sugar. Mix well to combine and moisten all the sugar and then let stand for 10 minutes, stirring occasionally. Meanwhile, in a small saucepan, combine fruit pectin and 3/4 cup water. Bring to a boil on high heat, stirring constantly. When it boils, set a timer for one minute. Continue to stir constantly and then remove from heat when it has boiled for one minute. Stir pectin and water mixture into the fruit and sugar mixture. Stir constantly for about 3-4 minutes or until sugar is completely dissolved and mixture is no longer grainy. Stir in chopped basil leaves. Pour mixture into freezer containers with tight fitting lids (jars work great). 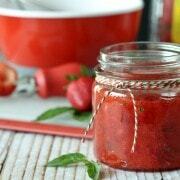 Let jam stand at room temperature for 8 hours before moving to the fridge or freezer. If you freeze it, thaw it in the fridge when you’re ready to use. Disclaimer: I was given free OXO products and Driscoll’s berries to work with but was no compensated otherwise. All opinions are as always my own. Post contains affiliate links. I just love this jam!! Freezer jam is just my style! Easy and delicious with the addition of basil! Is it possible to process this so that you don’t have to freeze it? My freezer is always too full. Probably but canning is not my forte so I’m unable to tell you exactly how to do that, sorry! Can you substitute the sugar with splendid or Stevia? Not with regular fruit pectin because the sugar helps it set. You could try it with no sugar pectin (like this). I believe I am missing when you add the basil. I have read it several times and can’t find where it should be added. Which step is that, please. You’re so right — sorry about that! I added it to step 4, the last step before you pour the mixture into jars. Every year I sweat through making jam. This year I’ll just freeze it! I worry about glass jars in the freezer. Can you use plastic containers instead? BTW – I agree with your opinion of OXO. My digital scale, which I loved, stopped working after 18 mos. & I wrote them asking about the warranty. They sent me a free one! Great customer service. Looking forward to trying this jam. Two of my favorites—strawberries and basil. Yum! I’ve never made jam. I think this might be the best way to start making it… It looks super easy and I’m sure taste divine! 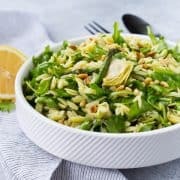 This looks super yummy and easy! My kind of jam! 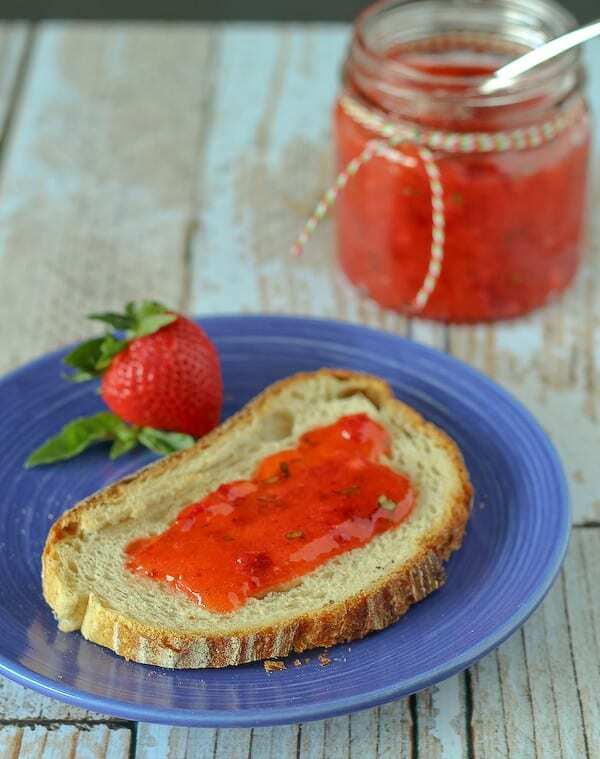 love strawberry jam–not sure about putting basil in it, though, for me. I totally need one of those handy tools! I was eating strawberries last night thinking as much. 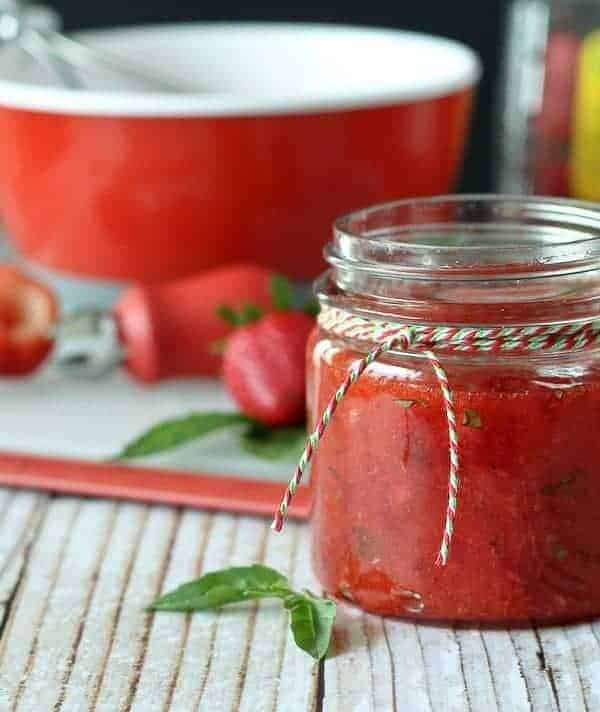 I love this jam with the basil!! 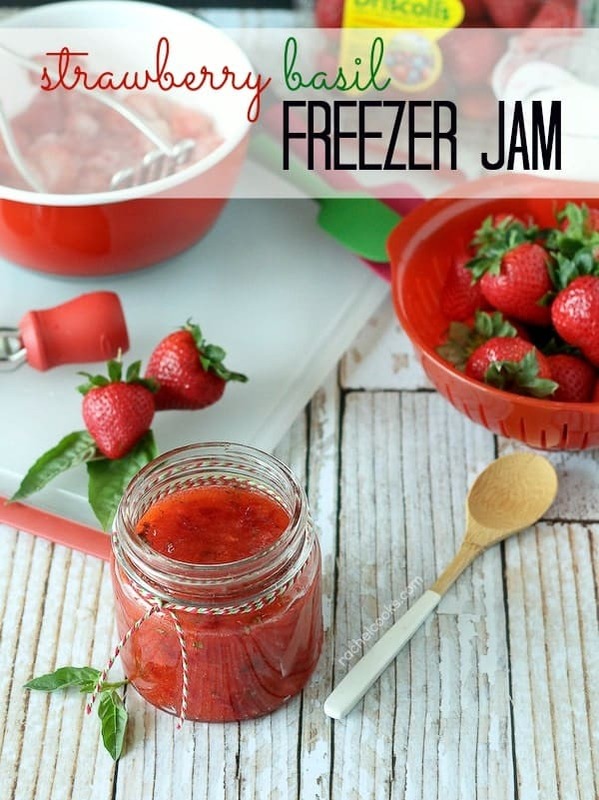 I grew up making strawberry freezer jam with my momma, too! This is glorious. 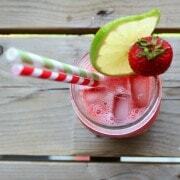 Strawberry and Basil are the best flavors together! 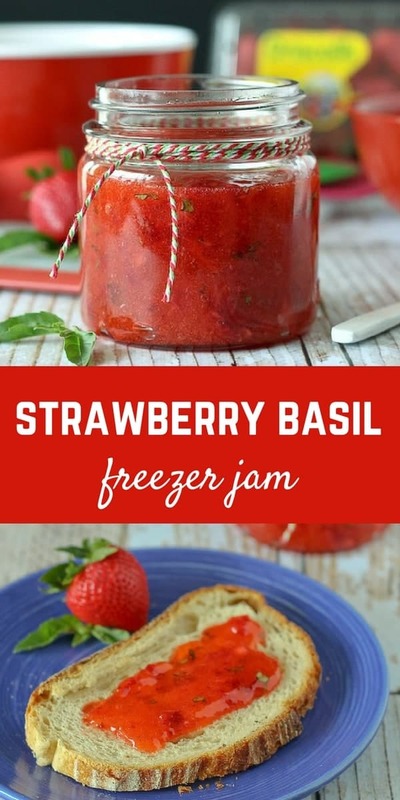 Freezer jam is so great, I can’t wait to try this! I love freezer jams! The addition of basil is blowing my mind!! Love it! Pinned!